I’m in the process of reading some of the papers from The circulation of capital: essays on volume two of Marx’s ‘Capital’ (1998). A number of the papers point to the relevance of Marx’s Volume 2 to the current structures and ways in which modern capitalism is analysed. Other of the papers are helpful in explaining the dialectical method used by Marx in his analysis with the clear implication that that method is still essential today to analyse capitalism. So, I offer below an extract from the General Introduction as a preliminary guide to accessing this book. – Marx often wrote things in certain ways without explaining clearly why he was doing this. He didn’t like to point out where his argument was heading because that would prejudice the rigour of his analysis. This makes him harder to understand to us spoilt moderns who are used to being hand held along the way. – Marx is deep and hard to understand anyway, so we need all the help we can get! Marx’s Capital Book II, ‘The Circulation Process of Capital’, is divided into three main parts. In Part One, Marx considers the metamorphoses capital undergoes in its circuit, namely as money capital, production capital and commodity capital. Of course, in normal conditions, this sequence is expanded into a regular imbricated set of sequences such that at any given time a different component of the total capital is present in each form. In Part Two, Marx examines the circuit as a turnover. He shows how various components of capital (for example, so-called ‘fixed’ and ‘circulating’ complete their circuit at different rates; he argues that the influence of the circuit’s periodicity, and the varying ratios of such components, must affect the annual rate of surplus value. In both these parts capital as such is treated; but it is not considered as a system of capitals; however, the reproduction of any given capital is necessarily bound up with the reproduction and circulation of the total social capital. Thus in Part Three, when Marx considers reproduction, he examines the revolution of this totality which necessarily includes not only the intertwining of each individual capital circuit with others but the whole circulation of commodities, those commodities bought by the workers to maintain themselves as well as those means of production capitals sell to each other. On this basis Marx distinguishes two ‘departments’ of production: those producing means of production and those producing means of consumption. This very division, as well as the analysis of the relations between these departments, is one of the enduring achievements of Marx’s work. The relatively ‘technical’ character of much of Book II misled Engels, for one, into thinking that the argument concerns only relations between capitals; this is a grave mistake, for class relations are integral to capital and thus the matters dealt with here stand in intimate connection with its class basis; for example, capital’s concern with shortening turnover time has consequences for the intensity of labour, and the very choice of criterion for discriminating departments is rooted in the necessary reproduction of class relations (as Mattick points out in Chapter 2). We turn now to outlining the sequence of essays in this volume. We begin with two papers that pertain to Capital II as a whole. Paul Mattick shows how Book II fits into the overall structure of Capital. He argues that, just as the social form of commodity exchange that formed the starting point of the analysis in Book I was unmasked as the social form of an exploitative class relation obscured from view by market relations, so in Book II Marx considers how that form is structured in terms of the circulation of capital. The circulation of capital as a totality among economic categories gives rise to the idea of ‘the economy’ as an autonomous system of forces rather than a feature of a particular form of social life with a particular class structure. Marx’s analysis of reproduction in terms of the two departments, Mattick indicates, shows how the categories of the market lose their explanatory independence. In this context he shows the underconsumptionist explanation of economic crisis to be an untenable interpretation: effective demand is determined by capital accumulation. The schemes of reproduction then highlight the conditions for the possibility of economic crisis, along with the existence of capital as a class relation, rather than the issue of maldistribution of income or of disproportionality ­between departments of production. In the following paper, Patrick Murray indicates that the purpose of Capital’s middle volume is to deepen the analysis of the double character of the commodity (use value and exchange value) of Book I and to show that what circulates in a capitalist economy is capital. In stressing that commodities in capitalism are use values which have the specific social form of capital, Murray convincingly takes distance from the view, held by Sweezy for example, that use value is irrelevant to Marx’s analysis. In this perspective his main focus is to debunk the ‘commerce and industry’ picture of the economy in capitalist society. This picture breaks down capital’s circulation into a generalized circulation of wealth whose basic forms are money and commodities, buying and selling (‘commerce’), accompanying a production process which, devoid of any determining social forces simply transforms material inputs to create new wealth (‘industry’­). Murray points out that, oddly, this pictures leaves out capital itself. In criticising it he shows how the categories of the commerce and industry picture prove conceptually too ‘thin’ to grasp the circulation of capital; likewise ‘thicker’ co-involvements of use value and value must be acknowledged in order to comprehend capital, its turnover and reproduction, productive and unproductive labour, and fixed and circulating capital. For example the phenomenon of the material reshaping of circulatory functions (see Smith, Chapter 4 on ‘lean production’ delivery systems) would be unintelligible on the basis of the ‘commerce and industry’ picture. In an appendix, Murray shows that Ernest Mandel erred in claiming that Marx came to the conclusion that labour in ‘service industries’ cannot be productive because it is not ‘concrete’ and does not result in a free-standing product. The next paper, by Tony Smith, directly relates Part Two of Book II of Capital to recent trends in contemporary capitalism and its apologetic. Marx here derives a drive to lower circulation time and circulation costs. Analysing the move towards so-called ‘lean production’ in the perspective of Marx’s thesis, Smith concludes that this development corroborates the theory. Next he moves on to considering lean production from another perspective of the Book II analysis. Marx argues that in the circulation process capital accumulation is the independent variable and consumer activity a dependent variable. The defenders of lean production insist that, while this indeed holds true for the era prior to ‘lean production’, the reverse now obtains: information technologies allow manufacturers to trace changes in consumer desires accurately; and flexible production techniques allow firms to shift production rapidly in response to new consumer demands. So, they claim, true consumer sovereignty is now being instituted for the first time; the consumer is the sun around which the lean production system turns. If this claim is warranted, Smith allows, the Marxian perspective in this respect is refuted. However, building on Marx’s account in Book II of the place of consumer activity in the circulation process of capital, he argues that overcoming conflicts in the relation of capital to consumers requires a thoroughgoing social transformation far beyond the possibilities of ‘lean production’. In his own paper, Chris Arthur calls attention to the significance of the introduction of the concept of ‘circuits of capital’. He examines Marx’s theory of the circuits of capital outlined in Part One (chs 1-4) of Book II. He traces the form of the circuit and shows how it may be viewed as the imbrication of three circuits. On this basis he argues that capital cannot be understood as a fixed form but only as the totality of functional forms through which it passes in its circuit; that is, capital exists as the identity-in-difference of all its functional forms, an identity established and maintained only in its movement through them. Such a view of the three circuits Marx distinguished he illuminates by outlining its background in Marx’s knowledge of Hegel’s Logic, and especially therein his theory of the syllogism which examines successively its mediation in the universal, the particular, and the individual judgments. In addition Arthur addresses a surprising feature of the recently published 1865 manuscript of Book II, namely the appearance in it of four circuits, not three. Martha Campbell’s essay examines Marx’s explanation of the functions money must perform in the circulation of capital. In the first part of the paper she provides an important outline of the methodological frame of Marx’s monetary theory of Book II, explaining why Marx adopts particular assumptions for his analysis (an analysis that runs in fact throughout Book II). From his analysis of turnover Marx concludes that capital must occupy all three of its forms simultaneously; although the money form is no less transient than the others, Marx demonstrates that money hoards are required by the needs of circulation, and this is the foundation of his explanation of the credit system. Capitalists transform their hoards into interest-bearing capital in order to gain an additional share of the social surplus value. As a result money capital is concentrated in banks and in the bond and stock markets. Campbell argues that, by analysing capitalist reproduction apart from the credit system, Marx shows that the possibilities for its disruption are not limited to the problems resulting from debt and the conditions of credit. In proposing that the credit system develops so that capital in its money form will bring in surplus value, Marx is rejecting the claim that it develops to solve the problem of the shortage or high cost of gold money. Campbell concludes that the credit system complicates rather than simplifies capitalist reproduction and renders it more precarious. In Chapter 7, Fred Moseley examines Marx’s reproduction schemes of Part Three of Capital II against the background of correspondence between Marx and Engels and the Theories of Surplus Value. He argues that the initial purpose of Marx’s reproduction schemes was to refute Adam Smith’s view that the price of the total commodity product of society is entirely resolved into wages plus profit plus rent; that is, entirely resolved into revenue with no component left to replace the constant capital consumed in production; he notes that Quesnay’s Tableau Economique could have helped Marx in so doing. Important to this refutation, Moseley indicates, is the distinction between money which functions as revenue and money which functions as capital. Emphasizing that Marx extensively criticised classical economics’ conception of capital as merely physical means of production, common to all types of economic systems, Moseley in the course of his paper contests Sraffian, or generally neo-Ricardian, interpretations of Marx which read his analysis in physical terms. Finally Geert Reuten’s paper examines the same Part Three from the perspective of Marx’s method: is it akin to a modelling approach as we find it in modern orthodox economics, or does it rather fit into a systematic-dialectics methodology? More so than any other part of Marx’s work, his theory of reproduction influenced orthodox economics: it laid important foundations for its later macroeconomics and theory of the business cycle. Why particularly this text? In answering these questions the major part of Reuten’s paper is devoted to an examination of the systematic character of the exposition of Marx’s reproduction theory, focusing on its procedure in laying out assumptions. Reuten concludes that, while the text may not be incompatible with a systematic-dialectical methodology, it is certainly defective in that respect; rather the textual evidence favours the view that Marx, in this part, takes a particular modelling approach. The papers brought together here show differences in historiographic and analytical emphasis and this makes them complementary studies. Certainly many questions concerning Marx’s Book II of Capital remain unanswered, an obvious example being why dialectics can be so prominent in Part One (Arthur) while trifling in Part Three (Reuten). 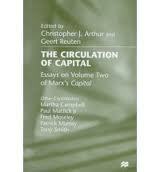 All the authors agree that this work is crucial in understanding the trilogy of Capital and its method. Without this middle book we cannot grasp the juxtaposition of the analysis in the other two. There is no talk in this section of greedy, selfish, power seeking capitalists but only some passing references to how money can make fools of all of us. He is explaining money, not condemning it. He pursues this approach rigorously but without explaining why he approaches money in this way. The strength of Suzanne De Brunhoff’s book is that she fills this gap. She explains that Marx is outlining a General Theory of Money and a Complete Theory of Money and the reasons why. My introduction to De Brunhoff here can’t be a substitute for reading her or even less a substitute for reading Marx. But I think her work is valuable because she provides some extra connective tissue to the body of Marx’s work, some overall perspectives that he didn’t provide. Both Marx (1818-1883) and his predecessor Ricardo (1772-1823) saw value as originating in labour. One difference between them is that Ricardo just accepted that as the way things were, whereas Marx saw value as a perverse social relation which would have to be overthrown. Marx chose the commodity as the starting point of his critical study of capitalism and political economy. A commodity is different from a product in that it is both a use value and an exchange value. A product is just a useful thing whereas a commodity is produced for the purpose of being exchanged in the market place. Use values as products of labour are always useful no matter what the social system. Value, on the other hand, is a social category which arises from the exchange process. You can imagine societies both past and future where there is no exchange of products and hence there would be no value category. eg. there would be no value in a hunter gatherer society where individuals or families provide mainly for themselves and there is limited exchange of products occurring. You can also imagine a future communist society where people just take the things they need from a commons, there is enough for everybody. There would be no exchange and no value category. “From each according to their ability, to each according to their wants”. Of course, such a society could not be arrived at immediately and the transition process is far from clear. But it can be imagined. How does Marx’s commodity starting point relate to our understanding of money? What follows from the analysis of the commodity as a unity of use value and exchange value is that money originates in commodity value. Value is an abstraction that has to appear (reference Patrick Murray).Exchange value is the form of appearance of commodity value (reference Marx, The Value Form). Money crystallises value in a physical sense. Gold becomes money. The social relation of value (social because commodity exchange is a social process) ends up taking on a physical form. Since the exchange of commodities involves an equivalence relationship Marx describes money as the perfected form of the general equivalent. Other economists don’t see money as originating from the commodity. A common view is that money is a convenient symbol to facilitate exchange, since barter is too inefficient. The quantity theory of money takes the view that the value, properties and quantity of money all originate from money itself and not from the commodity. If you don’t understand the origins of money in the value form of the commodity and even if you understand that value originates in labour, as a quantity, then you will lose your bearings completely when capitalists create different forms of money such as banking money. Money, as “the perfected form of the general equivalent” may cease to be metal but it can’t escape its origins in the commodity, which is a unity of use value and exchange value. Moneys’ essential functions (measure of value, medium of circulation, money – object of demand) can be traced back to the use value / exchange value contradictory nature of the commodity or evolve out of it. Those essential functions of money never go away even though capitalists create forms of money, such as credit, which attempt to negate those functions. Is money just part of the machinery of capitalism or does it have a broader necessity? The way in which the capitalist uses money, to employ wage labour and buy means of production, and the way in which the average worker uses money, mainly to buy necessities, suggest that some of its functionality is bound closely to the inner workings of capitalism whilst other of its functionality is more benign and may be useful in a post capitalist society. By contrast, utopian schemes such as The Zeitgeist Movement and The Venus Project aim to overthrow “the system” by popular acclaim, abolish money and replace the market with computer surveys of peoples needs. Such movements by pass the need for a real analysis of the diverse functions of money. So, what is this abstract society that uses money but is not capitalist? A simple commodity economy is not capitalism because capitalism involves ownership of the means of production and the hire of wage labour by those who own the means of production. The money used to buy means of production and wage labour is called capital. Capital can be money but not all money is capital. Marx develops a general theory of the circulation of commodities and money. By contrast, capitalism develops institutions such as Banks and money such as credit, which are specifically designed for the needs of capitalism. Marx delays detailed treatment of these until Volume 3. We have already explained the difference between a simple commodity economy and capitalism. De Brunhoff also differentiates between a barter economy and a monetary economy. Once production transcends individual needs then, in becoming social, it involves exchange. The simple commodity economy that Marx discusses transcends barter and uses money for exchange. Once gold money emerges as always useful or the “god of commodities” (Marx) or as the universal equivalent then hoarding of this precious substance will follow. Hoarding becomes one of the essential functions of money (categorised under money as money). Marx chooses his starting point (private commodity production and exchange of commodities using money) because it is a “good abstraction” for explaining the fundamentals and subsequent development of capitalism. Marx’s method here in choosing a metal as money is a good example of ascending to the concrete, as part of his dialectical approach. It could also be seen as utilising an object to think with. This was also a strategy employed by Seymour Papert, a modern day computer scientist and learning theorist in developing the logo programming language which features a turtle as an object to think with (reference). From the latter perspective a simple commodity economy as explained by Marx could be programmed fairly easily in today’s visual programming languages such as Scratch, Build Your Own Blocks or Kedama depending on the level of complexity required. This could be done up to the point of illustrating Marx’s quantity of money theorem depending on the price of commodities (directly) and the velocity of money (inversely). This is the opposite of the idea that gold is a symbol of value. Gold is commodity money. Gold as money is distinct from all other commodities. Without a clear distinction between the money commodity and other commodities then all commodities would or could be money and money would be just another commodity. With such thinking the monetary privilege assigned to gold appears arbitrary and unfounded. Some have argued in Marx’s time (Gray’s theory of labour money, Proudhon) and today (The Zeitgeist Movement and The Venus Project) that the key to solving the problem of capitalism is to abolish money or the privileged place of money. What this misses is that the origin of money, actually the necessity of money, is in the commodity with the commodity being a unity of use value and exchange value. Hence, to solve the problem of capitalism you have to solve the problem of the commodity, which is a far bigger or more fundamental problem. Although it originates from all commodities, money is special and develops its own properties and functions distinct from other commodities. The important point is not the metal aspect but moneys’ unique role as the general equivalent. Yes indeed! One aspect of this is that money as gold disappears. In Marx’s time gold money had disappeared in its role as (1) measure of value and (2) medium of circulation. And since Marx’s time it has further disappeared in its role as world money. So, money originates in the commodity and then more or less totally disappears. This disappearance of commodity money highlights the importance of understanding Marx’s analysis of the fundamental functions of money based on its origin as a commodity. The material disappears but the functions do not. What determines the general price level? The subjective utility theories of price that overthrew and replaced Marx in mainstream economics have created a difficult problem for themselves that was already solved by Marx. and so commodities have a price before they enter circulation. Problem solved. Note though that the actual presence of gold is not required for this function. To assign price through the above equation gold money does not have to be physically present. Ideal or imaginary money will do the job. It has become legally sanctioned as money of account pounds, shillings, pence, etc. One ton of iron is sold for 2 ounces of gold which is then used to purchase 2 quarter of wheat. The physical presence of money in the circulation process acts as a practical guarantee that the measure of value function has been performed correctly. Marx’s anti-quantity law is the opposite of the view that the quantity of money determines prices. This is all very clear provided money is gold. So we can surmise that Marx made money gold in part to make his argument clear or concrete. As mentioned above, it would be worthwhile to present this visually in one of the modern visualisation programming languages. Alan Kay, computer scientist, drew inspiration from learning theorist Jerome Bruner’s slogan “Doing with images make symbols” in developing etoys in smalltalk. (Alan Kay’s Educational Vision) We can write a program using gold as a concrete manifestation of the universal equivalent to make a qualitative and quantitative model of Marx’s version of the circulation process. Marx’s philosophy of ascending to the concrete can be programmed on modern media. This is all clear when money is gold. But the reality is that gold money disappears. In circulation the wear and tear on coins reduces their weight and makes demonetization inevitable. The standard weight of gold coins ceases to be a real equivalent of commodities. Gold is replaced by tokens. Marx’s response to this is to say that the tokens which replace gold must represent the real value of gold quantitatively. Representative or symbolic money or tokens will suffice. Gold does not have to be present. Nevertheless, it appears that the ongoing dematerialisation of money as governments introduce fiat money (government issued legal tender, inconvertible, used for the payment of taxes) into circulation appears to totally undermine or abolish Marx’s alleged laws of circulation. De Brunhoff goes into Marx’s differences with Ricardo, who supported a Quantity theory of money, that the amount of money in circulation determines prices. What arises from that discussion is the need to distinguish between the different roles of the different types of money – gold, fiat, credit. Tooke and Marx criticise Ricardo for attributing the same economic role to different types of currency. Ricardo was obsessed with the quantity of money in circulation without distinguishing between the different types of money. How may these different types of money be categorised? Marx is very clear that credit follows different laws to true money and so separates off and delays the discussion of credit to volume 3. So gold is true money (but no longer exists legally! ), credit is false money (because it is only of use in circulation, functions 1 and 3 are ignored?) and the US dollar is diseased money (legal but printed in excess – Quantitative Easing)? This need further clarity. Is fiat money true, false or diseased? De Brunhoff is ambivalent here. See page 36. She says it is true insofar as it represents or symbolizes gold. But then suggests it is false because it is condemned to remain in circulation, that it can’t be hoarded. Remember that the ability to hoard, the third function of money, is necessary to complement the other two functions, since hoarding is essential to control the quantity of money in circulation. She concludes that fiat money is true but bad money. But is this true, don’t banks withdraw paper money? I’m confused about this issue of whether or not paper money can be hoarded. Was Marx a metallicist? No, but he was a 3 way functionalist who asserted that true money, commodity money, which originates before capitalism, followed definite laws. And these laws do not magically disappear when full blown capitalism arrives and develops it own forms of diseased money such as credit. So, what are Marx’s laws of money? In the footnote Marx is incredulous at Fullarton for thinking that the replacement of gold with paper symbols can be interpreted as meaning that gold no longer represents the value of commodities or a standard of price. The possibility of hoarding arise from the coming into existence of the universal equivalent as a real, material substance. The commodity circuit C-M-C splits into C-M and M-C. Someone sells a commodity and acquires money. Their is no obligation for them to spend that money immediately. Hence, C-M-C is very different from C-C, direct commodity exchange. The desire for hoarding is simply money lust, money as the ideal abstract wealth. The real economic function of hoarding is as a regulator of functions 1 and 2, to keep the right amount of money in circulation. Does money solve the problem of equilibrium between functions 1, 2 and 3? De Brunhoff has some discussion on the differences between Marx and Keynes in their treatment of liquidity and the problem of the limited supply of money. That required further study. The C-M-C split into C-M and M-C suggests the possibility of crisis because the possibility now arises that buying and selling will no longer be in equilibrium. There is no guarantee that those who buy will sell. But the possibility of crisis is a far cry from the reality of crisis. Marx has shown that for a simple commodity economy there can be equilibrium. Money as such is not the problem. Capitalism is the problem. In the rough drafts of his works (early drafts of the Critique and Grundrisse) Marx discussed the social power accruing to individuals and notions who hoard money. This is in stark contrast to those reformers who see “money as the root of all evil” or the elimination of money as the nirvana which will solve all social problems. It is true that money is power but that is more to do with Capital, not money as such. Money accumulates to certain individuals. They have privileges. Some go onto become successful capitalists. But money is not the same thing as Capital. Capital needs to be dealt with later after establishing the fundamentals of money. The State / Central Bank has some apparent control over money and can exercise power through monetary policy. They can decide to maintain or not maintain a gold standard, they can print more paper money, they can alter interest rates and control credit through fractional reserve banking policies. However, what follows from the outline of Marx’s fundamental functions and laws of money is that in the final resort all this power is more apparent than real. Marx’s anti-quantity theory is based on the coherence of the 3 functions of money (measure, medium, hoard). It follows that the quantity of money in circulation is proportional to the sum of prices. Capitalist money such as credit floods the money market and breaks Marx’s law. We can either retain Marx’s law and query the legitimacy of capitalist money, ie. see it as diseased, or, we can see all money as non diseased. If we do the latter then money doesn’t make a great deal of sense, fundamental truths of the functionality of money and capitalism are lost and we are left in a sea of confusing surface phenomenon. That is my understanding at this point. Is it possible for any of the 3 functions of money described by Marx or their intimate interrelation to be somehow negated? How is it possible for a non commodity such as the diseased US dollar to measure value accurately? update (10th Jan): This review of Suzanne de Brunhoff’s book is only a review of Part one: The Marxist Theory of Money.. Hopefully, I’ll also be able to review her part 2: Money and Capitalism, which refers extensively to Vol 2 and 3 of Capital. Marx’s Explanation of Money’s Functions: Overturning the Quantity Theory (2003) by Martha Campbell. The comments about this paper by conference participants in the third column at Papers should be read in conjunction. My comments here are partly a summary and partly reflections that have arisen from thinking about Campbell’s paper. As always, read the original. Marx was fully aware that capitalist money or credit is not gold. Yet he insists on developing a theory of money based on gold in Capital vol 1 and 2. Campbell argues that he does this because he believed that the main obstacle to understanding anything about money is the Quantity theory. Hence, we are implicitly involved in a discussion where starting points are of vital importance. Marx starts with gold as money, other economists start with what they find on the surface of social reality. In my opinion, Marx wins out because his starting points are superior to those of other thinkers. It’s obvious that the quantity theory is right, isn’t it? Ben Bernanke decides to print more money to “save” the economy. In his view inflation is better than deflation. So the value of money must decline. The quantity of money Bernanke decides to print determines the value of money. This is what Marx says is wrong. In what sense then is Marx correct? There are different types of money – gold money, paper money issued by the central bank and credit money which can be issued by anyone. You could say that Marx’s principles hold true for gold money or paper money that is convertible to gold but don’t hold true for other types of money. So, given that, since 1971, we no longer have a gold standard then aren’t Marx’s theories no longer relevant? Since credit money escapes from Marx’s first function of money (money is a measure of value using the commodity gold as the measure) then, in that sense, it is not true money. The same could be said of paper money issued by governments through the printing press (quantitative easing) in times of crisis. Everyone knows that this money is not worth much. In times of crisis the value of this sort of money crashes back to earth, the earth that contains gold as a true measure of value. I also found Campbell very helpful in pointing out clearly that in Chapter 3 of Capital vol 1 Marx is discussing the price form, which is separate from any discussion of a measure of price. Part of the problem with “economics” is that it is obsessed with measurement, ignores social forms in its own analysis and does not even notice that Marx is emphasising that many of the thing we take for granted (eg. the commodity, money, price) have a social origin and meaning. Marx explains how capitalism really functions as a social system in contrast to “economists” who seem to do little more than watch the stock market go up and down. Since prices can and do deviate from values then part of our answer to the Quantity theorists is that they are talking about prices and we are talking about values. Prices may be all over the place, eg. during inflation, but values are the important underlying measure of how the economy is really performing. Moving on. Campbell’s argument about money beginning as a commodity (gold) and then progressing, since Marx’s death, to not being a commodity are not so clear to me. “… money is the materialisation of value … money must be a commodity, at least until it can be shown how money could represent value without being a commodity” (page 6). My question here is: How could money represent value accurately without being a commodity? Campbell doesn’t seem to provide an answer to that in her paper. This point was also raised by some of her fellow presenters at the conference.